There have been many creative uses of colored single-ply roof membranes over the years, but Colorado Springs, Colorado’s “star spangled” TPO roof stands out as a marvel of craftsmanship. The construction of the 117’ x 65’ American flag meets federal specifications and became a morale booster for Colorado Springs residents. Roofing contractor, Scott Riopelle, and foreman, Don Doubleday, had been looking for a roof to accommodate a U.S. flag for some time. Then, on June 6, 2012, a severe hailstorm damaged the modified bitumen roof of a building on Academy Avenue, as well as many others. 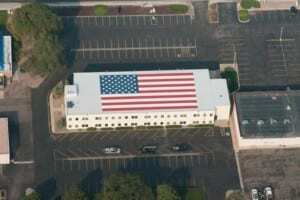 It looked like Riopelle’s company, Interstate Roofing, had found a potential home for its 76-square U.S. flag. IntelliTec Medical Institute had leased the building for about 15 years from property owner Ernest Dill when its custodian noticed water pouring in from the roof. Dill’s attorney contacted Interstate Roofing in Denver for a quote on the roofing work. The surprise came when project manager, Jake Reid, broached the idea of the huge flag while walking the roof with the owner’s representative. It turned out that the roof was in the flight line of military aircraft from Peterson Air Force Base. The U.S. Air Force Academy and Fort Carson (U.S. Army) are also located nearby. “The roof gave us an opportunity to thank our people in the military service every day,” says Dill, who is a retired president of Western Colorado College.